Everyone has Christmas traditions- the games or movies that occupy a day spent in pajamas. At my in-laws house, we usually sit hunched over a puzzle for hours, inevitably searching for a single errant piece to complete the increasingly larger picture made of smaller and smaller pieces. In an effort to escape the puzzle arm's race this year and out of a selfish desire (I know not really in the Christmas spirit) for some free labor, I brought over this Technic Off Roader set. 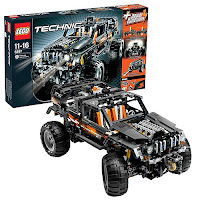 The power-functioned HUMMER look-alike is a behemoth at 1,097 pieces. However, it gets better mileage than it's really life counterpart as it is powered by hand. This ended up being a three-day project, built at length by four different builders. However, I got to experience the joy of watching my wife's family reconnect with LEGO as adults and see them learn to read the instructions and marvel over the power functions controlling the headlights, hydraulics, and winch. A loose system even developed where one of us acted as a parts monkey, gathering all the pieces for a given step, in order to free up the lead builder to snap together the Technic elements. It's great to build with others because it doesn't happen very often. And that is in the true holiday spirit- it turns out it is fun to share. I didn't buy this when it came out. Oh, well. Here's hoping that the next one like this is even more awesome.